HANNOVER, Germany, Sept. 21, 2018 /PRNewswire/ — On September 19, 2018, the 67th IAA Commercial Vehicles Hanover was opened officially. Daimler exhibited its truck products at Daimler exhibition booth. As Daimler’s typical business representative in China, BFDA exhibited AUMAN EST-A at the Daimler booth, together with Mercedes-Benz trucks. This is the third time for BFDA to exhibit at IAA Commercial Vehicles Hanover since its founding in 2012. AUMAN EST-A is developed and manufactured by BFDA and built with a world renowned power and parts supply system, including Cummins, ZF, WABCO, etc. Mainly aiming at the long-distance special routes and high-efficiency logistics markets, AUMAN EST-A is equipped with an intelligent power system, aided driving, and a fleet management system, and is verified by 10,000,000km real road test to further meet customers’ appeals for high operating efficiency and low operating cost. In succession to the market launch in Shanghai, China, in April 2017, AUMAN EST series has been launched respectively in Peru, Chile, Russia, Kenya, Thailand and Malaysia, covering the South America, Southeast Asia, and Africa markets. On September 18, on the eve of the IAA 2018, a global press conference was held by BFDA at the IAA. Mr. Gong Yueqiong, the president of Foton Motor Group; Mr. Martin Daum, Daimler AG. Board member and the Head of Daimler Trucks & Buses Division; and Mr. Hubertus Troska, Daimler AG. Board Member as well as the Chairman & CEO of Daimler Greater China, attended the conference. Since the founding of BFDA in 2012, Foton Motor’s manufacturing standards, local operation experiences, and market advantages have been effectively integrated and collaborated with Daimler’s technology and management advantages. BFDA is operating under FOTON “AUMAN” brand, which overwhelmed the joint-venture mode of introducing foreign mature vehicle models for OEM production in traditional Sino-foreign joint ventures and initiated the new Sino-foreign joint-venture cooperation mode. Meanwhile, Foton Motor owns the utilization and proprietary rights of intangible assets of “Auman” medium-duty and heavy-duty truck products, including proprietary technologies, patents, and branding, in overseas markets. Daimler provides technology, expert supports and Truck Operating System (TOS) to help joint venture promote product quality, improve supplier systems, and assist the R&D of new products. Foton Motor provides branding, manufacturing systems, and market operation experience. Based on networks of Foton Motor, both will realize a further development in China and the global market. Through a 7-year joint development, BFDA has achieved an accumulative sales volume of 540,000 in global market as of August, 2018. The commercial truck market around the world is upgrading. “The future competition is definitely the competition of all-value chain solutions, including fleet management solution, technology matching, and integral commercialization strategy,” said the President of Foton Motor Group, Gong Yueqiong. “Daimler owns sophisticated technology and quality control, and Foton Motor owns leading manufacturing systems and mature market operation experiences, insight, and strategic deployment on the markets. The two parties have reached tacit understanding and consensus in cooperation. Therefore, on this basis, more competition can further embody the complementary advantages of two parties”. Regarding the joint venture development strategy, Mr. Hubertus Troska expressed that Daimler will introduce advanced products and technologies into BFDA and enhance the cooperation with Foton Motor in the future. Regarding the future cooperation of the two parties, Mr. Martin Daum expressed that the cooperation status between Daimler and Foton will not change. “BFDA will enhance the cooperation under complementary advantages of both, and will introduce a strategic heavy-duty truck in the future,” Mr. Gong Yueqiong added. Following the cooperation between Foton Motor and Daimler AG., it’s possible to apply technologies, including intelligent interconnection, autonomous driving, and new energy vehicles to cooperation projects in the future. 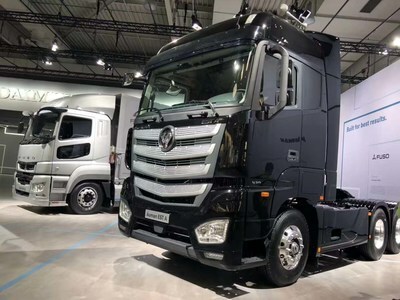 By advantages of both in technology, manufacturing, and market, Daimler will realize a further development in China’s commercial vehicle market. Foton Motor will also further consolidate its leading position in China’s commercial vehicle market. Meanwhile, Foton Motor will duplicate and expand the leading products and technologies to global markets, and thus, realize the leapfrog development of global commercial vehicle business.